In June, Teva received one of the highest honors in the pharmaceutical industry. A DIANA Award for Best New Generic Product Launch was presented to Christine Baeder, VP, Customer Operations and Teri Coward, Sr. Director, Sales at the Healthcare Distribution Management Association (HDMA) 2015 Business and Leadership Conference. The Distribution Industry Awards for Notable Achievements in Healthcare (DIANA) awards have been the key annual recognition of pharmaceutical and consumer product manufacturers, voted on by pharmaceutical wholesalers, for over 55 years. It is a highly anticipated industry event at the Business and Leadership conference each year; the awards honor companies for excellence in their new product introductions. 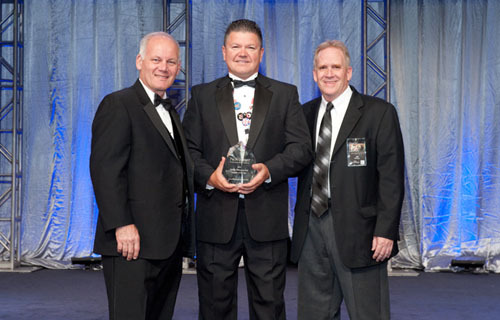 And in July, at the 5th Annual Novation Supplier Summit in Las Vegas, Jeff McClard, Senior Director, National Accounts and Cam Bivens, Director of National Accounts accepted the 2014 Generic Pharmaceutical Supplier of the Year award from Novation on behalf of Teva. The criteria for the Generic Supplier of the Year award is an organization that has shown significant sales growth each year, member usage and participation in events, overall engagement with Novation in operations and management of their contract, and the support of Alliance members through field- based sales teams. “We recognize that all of our contracted suppliers work tirelessly to bring value to the members and affiliates we serve through their products and services. The companies recognized as winners truly represent the best-of-the best.” said Pete Allen, Novation’s group Senior Vice President, Sourcing Operations. Congratulations to all the teams involved in these outstanding recognitions!